Previous recipients have been Chilcotin Plateau Enterprise Ltd. (CPE) owned by the Toosey Indian Band, Troy Young, GM of LTN Contracting Ltd.; Chief David Walkem, the president of Stuwix Resources Joint Venture from the interior of British Columbia; Grace Esquega, the President of Niigaani Enterprises in Gull Bay, Ontario; Percy Guichon, the Chief of the Alexis Creek Indian Band; Tsi Del Del Enterprises of Chilanko Forks BC and Al Humphrys, the general manager of Duz Cho logging, owned by the McLeod Lake Indian Band. The award nominees are judged against six criteria: business leadership, longevity, employment of Aboriginal peoples, safety and environmental performance, consistency of goods and services provided and commitment to the Aboriginal community. Forest Products Association of Canada (FPAC) and the Canadian Council for Aboriginal Business (CCAB) today announced that nominations are open for the 2019 Indigenous Business Leadership Award. 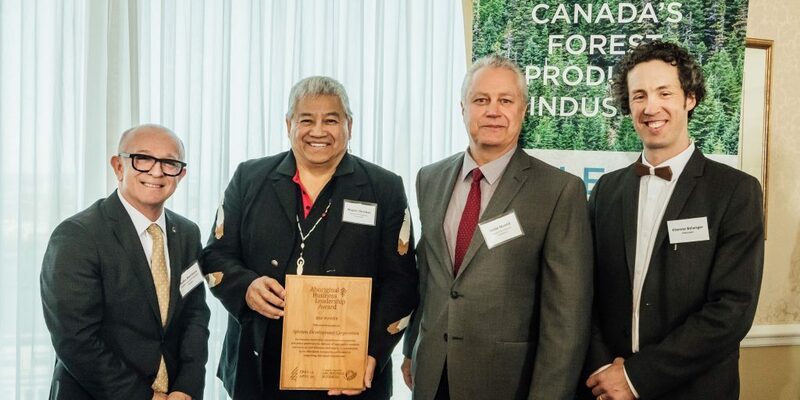 The $5,000 award recognizes and celebrates Indigenous entrepreneurs for their success in a forest products business that exemplifies business leadership, environmental and safety performance, and product quality. The recipient must also demonstrate a strong, long-term commitment to the Indigenous community, particularly in supporting Indigenous employment. Nominations are due March 31, 2019. Winners will be recognized and celebrated during FPAC’s annual award ceremony on May 9 in Vancouver.